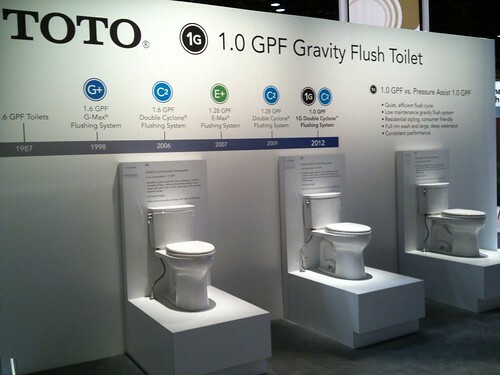 Japanese company TOTO shows off their latest high-efficiency toilets at a trade show. Net Zero Buildings Magazine is a publication focused on helping owners and architects create highly efficent—and ideally net-zero energy (NZE)—structures. Part of the NZE effort to make a very low impact includes high-efficiency plumbing, a concept that has been improving rapidly, according to John Mesenbrink in Net Zero Buildings' latest edition (page 38). Mesenbrink begins by noting the Energy Policy Act of 1992. This required all new toilets made or imported in the country to flush no more than 1.6 gallons of water by January 1, 1997. Fast forward to 2013, and plumbing technology has advanced to the point where 1.0 gallon per flush (gpf) and even 0.8 gpf is possible. The top reason to install high-efficiency plumbing—which includes urinals, showerheads and faucets along with toilets—is reduced cost. A toilet with a lower gpf rate will naturally save money on monthly water bills without costing much more from a standard toilet. When working on a space that might need plumbing work, choosing high-efficiency models is a great idea.